Everyone has a place to be, and they want to get there fast. And there is A LOT of blogging advice out there promising the secret formula to grow overnight and how you can make more than 6 figures in under 6 months. I’m not here to do that. Usually, that stuff is totally bogus. Slow and steady is the name of the game when it comes to blogging as it can take a while to find your audience and build trust, which is when you can then start translating that into income. But yes, there are certain tools that can help you get where you want to be a bit faster. Some are super simple, like hey, use a social media scheduler. Some require a bit more effort. 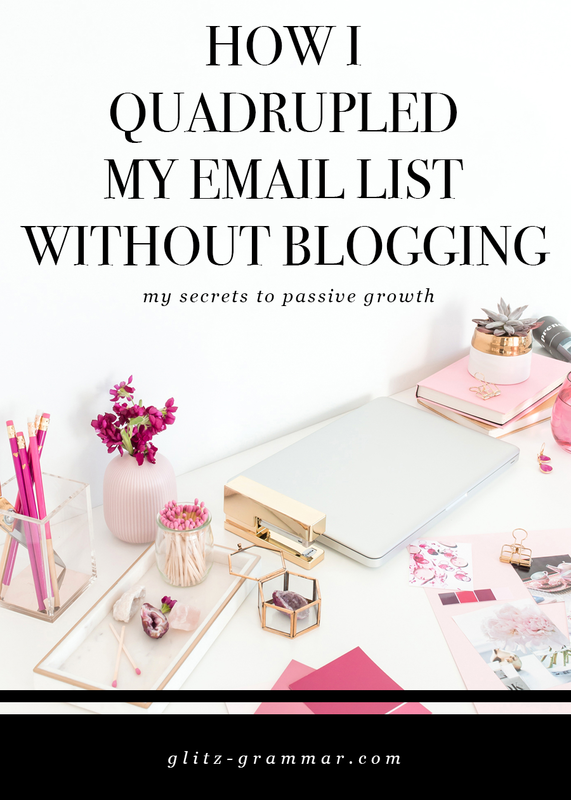 Today, I’m sharing how I grew my email list to more than 1,000 subscribers on a blog that only saw 4 total posts in a year. And had less than 45 blog posts total! This, my friends, is doable. Here’s how. It’s pretty much never a good idea to step back from your blog. But I went back to work full-time in 2018 and was unable to juggle my side business, my other blog, my family and life demands. So I took a blogging break on this blog, where I had less than 45 posts. In fact, I only wrote four posts in all of 2018! That’s not great. But, my email list continued to grow completely on its own. With no additional effort on my part. I use ConvertKit, and this is the #1 reason my email list was able to grow passively without creating any additional content. ConvertKit is made for bloggers and lets you easily create opt-in forms and content upgrades on every single blog post. You can see what’s resonating with your audience and what’s not. And you can see what they want more of! A good majority of my blog posts have a content upgrade, which is an additional workbook, cheat sheet or printable specifically created for that post. This is how I was able to continue growing my following, without creating any new content. This is also part of the magic about blogging in itself. Yes, it takes a while for your posts to gain traction. But once they do, they continue to work for you without making any additional effort. In fact, the next thing you’re probably expecting me to say is I stayed active on social media. Spoiler alert: I didn’t. In fact, I shut down my Instagram and my Facebook page. 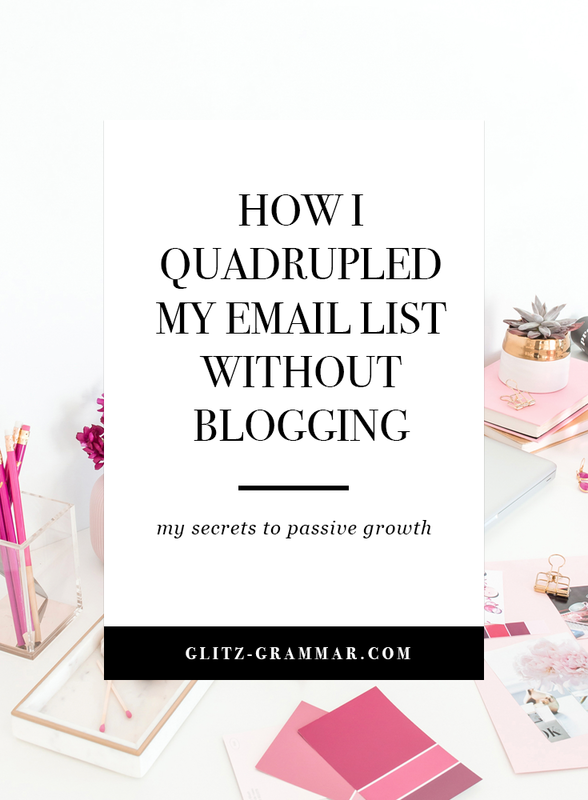 The only thing I continued to nurture was my email list because I saw subscribers were trickling in. A lot, in my opinion, considering the fact that I made zero effort other than letting my website still be alive. I do not and won’t recommend stopping blogging or your social efforts. But can you imagine the potential if you’re active and use these methods? Now that sounds lovely. To make this work for you, try an email program like ConvertKit or something similar where you can easily create content upgrades for your most popular blog posts! There are loads of other email platforms out there. In fact, I use Mailchimp for my other blog (free) coupled with Mailmunch (also free) for one opt-in. But it’s not nearly as simple, or intuitive, to create multiple content upgrades and lead magnets for each individual post. For that, you need software like ConvertKit, LeadPages, etc. And it has been an absolute game changer for me and my business. If you’re serious about growing your email list—and you should be!—I can’t recommend this enough. I grew 1,000 times faster while using this, vs. the free email and one content upgrade I have on my other site. Want to see what one looks like? Check out my landing page on my free e-course, How to Find Your Writing Voice. 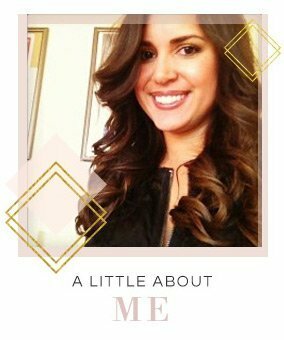 I created it with ConvertKit! The only other additional thing I did on occasion was check in on my Pinterest account. Pinterest is the #1 referrer of traffic to both of my blogs. And thanks to the looping feature in Tailwind, you can continue recycling your posts, and look like you’re still active on Pinterest even if you’re not. If you’re not familiar with looping, it’s a feature that used to be on BoardBooster before they got shut down that pushes your old pins to the top of a board again. I’m not going to dive into the technical aspects of setting this up as Tailwind has some fantastic video tutorials on doing this. And once you get the hang of it, it’s so easy to use! But again, once I went through the initial setup, it continued to work on its own. Which meant no additional effort on my part! I have an Evergreen Loop of pins that I want to be recycled all the time. This board is made up of my blog posts and affiliate links. I also created a seasonal loop; this refreshes all of my holiday pins starting around October of each year. This way, all of these pins get refreshed next year, right when Pinterest holiday search starts to peak again. You should, of course, be pinning on the regular. But, as I said, these are two passive systems that can be in place and still help you grow, without any additional content production on your behalf. It’s about working smarter, not harder, and making sure the content you’ve already created still gets seen! This is something I stress to all of my Brilliant Blog Plan clients, where we work together to create a strategic editorial calendar of posts so you’re not just blogging about any and everything without a purpose. If you want to grow your email list fast, get serious about your content upgrades and try a service like ConvertKit, coupled with Tailwind to keep your Pinterest presence alive. Thanks to this duo, my business has continued to grow on its own! 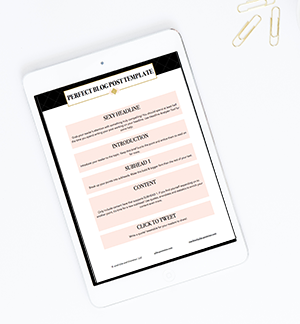 Grab the perfect blog post template free, plus weekly writing tips straight to your inbox! Previous Post: « The Best Feminine WordPress Themes: Beautiful, Girly and Strategic! Thank you for all the great tips on growing an email list! I need to get to work I’m actually emailing my list consistently! I’m so inspired by this! Love your content upgrades as a strategy for building your post. Definitely something so need to be focusing on to build my own list.